PURSUIT OF HAPPINESS: That was an OMG moment! Katie - I TOTALLY thought of you when I watched that relay because I know you love MP. That was the BEST Olympic moment so far!! Stupid French guys - they shouldn't have been talking trash - it just fueled the USA team to kick their ---. Kaitlin, did you hear Rob scream from there? He was yelling so loud when that race happened. It was really cool. He gets so nervous when MP races. It's like he is racing. Funny! GO USA! hahaha you should have seen me. i think me and michael were making the same faces and screaming just as loud. my mom walked out half asleep and i probably scared her really bad. HAHA, Since I work at home now I have been addicted to the Olympics!! That moment is my absolute favorite so far... what made it so good was not only the excitement on the other swimmers faces,,, but the sportsmanship Phelps showed the (trash talking) FREnch team!!!! I saw the "moment" replayed many times the next morning and definetely caught the spirit of it even then. I think I even cried one of the many times I watched it. It's a great example of never giving up. 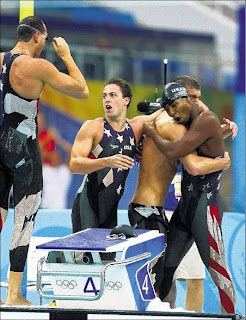 Jason Lezak said he had a moment when he thought he couldn't do it, then he just went for it. so great.